Easton LaChappelle has been taking apart things since he was a child and is now changing industries. 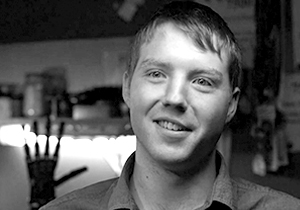 At 14, he made his first robotic hand out of LEGOs, fishing wire, and electrical tubing. We at Pioneers are proud to present our youngest speaker to date. We couldn’t miss the chance of flying out 19 year-old Easton LaChappelle all the way from Colorado. The young pioneer has been pulling things apart since the age of 14 and is now disrupting industries. His first robotic hand was made out of LEGO, proving that neither age nor money should decrease our game-changing ideas. This tech hero has improved his self-taught robotics skills, and has turned his initial Lego design into a 3D-printed invention operated with his mind. His inspiration? A 7-year-old girl at a science fair, with an $80,000 prosthetic arm. Something he found outrageously unaffordable. His improved prototype is already online for less than $400. 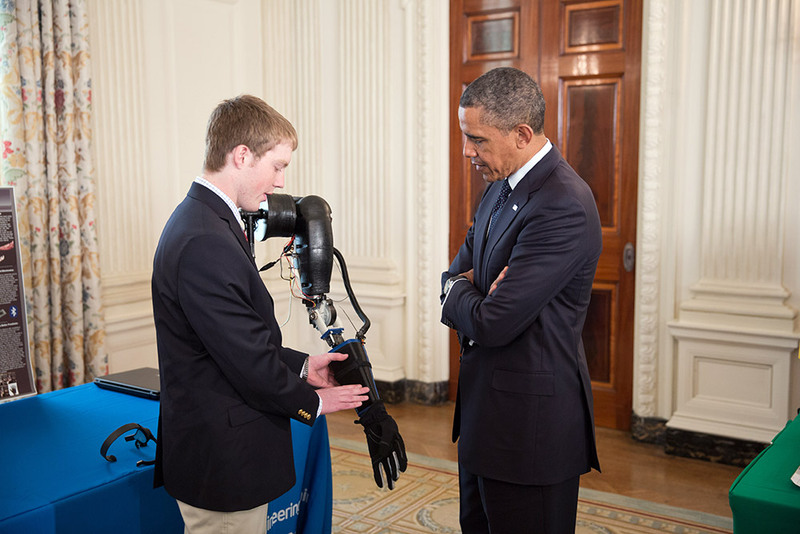 This young genius has even impressed President Obama, who shook hands with one of his robotic arms. A unique success story, that has already landed him a job at NASA. At only 19, he can already tell us all about founding his own company, Unlimited Tomorrow. Where he develops an exoskeleton to help paraplegics walk again. Easton’s robotic arm and designs are all open source, helping anyone to become their own engineer. Dieser Eintrag wurde veröffentlicht in Innovatoren und getaggt mit Easton LaChappelle, La Chappelle, robotic arm, robotic hand, Robotics am 8. April 2015 von innovation. The Google car knows every turn. It never gets drowsy or distracted, or wonders who has the right-of-way. Illustration by Harry Campbell. A case in point: The driver in the lane to my right. He’s twisted halfway around in his seat, taking a picture of the Lexus that I’m riding in with an engineer named Anthony Levandowski. Both cars are heading south on Highway 880 in Oakland, going more than seventy miles an hour, yet the man takes his time. He holds his phone up to the window with both hands until the car is framed just so. Then he snaps the picture, checks it onscreen, and taps out a lengthy text message with his thumbs. By the time he puts his hands back on the wheel and glances up at the road, half a minute has passed. Not everyone finds this prospect appealing. As a commercial for the Dodge Charger put it two years ago, “Hands-free driving, cars that park themselves, an unmanned car driven by a search-engine company? We’ve seen that movie. It ends with robots harvesting our bodies for energy.” Levandowski understands the sentiment. He just has more faith in robots than most of us do. “People think that we’re going to pry the steering wheel from their cold, dead hands,” he told me, but they have it exactly wrong. Someday soon, he believes, a self-driving car will save your life. Not quite. Skyscrapers and superhighways made the deadline, but driverless cars still putter along in prototype. Human beings, as it turns out, aren’t easy to improve upon. For every accident they cause, they avoid a thousand others. They can weave through tight traffic and anticipate danger, gauge distance, direction, pace, and momentum. Americans drive nearly three trillion miles a year, I was told by Ron Medford, a former deputy administrator of the National Highway Traffic Safety Administration who now works for Google. It’s no wonder that we have thirty-two thousand fatalities along the way, he said. It’s a wonder the number is so low. Smart cars were more flexible but also more complex. They needed sensors to guide them, computers to steer them, digital maps to follow. In the nineteen-eighties, a German engineer named Ernst Dickmanns, at the Bundeswehr University in Munich, equipped a Mercedes van with video cameras and processors, then programmed it to follow lane lines. Soon it was steering itself around a track. By 1995, Dickmanns’s car was able to drive on the Autobahn from Munich to Odense, Denmark, going up to a hundred miles at a stretch without assistance. Surely the driverless age was at hand! Not yet. Smart cars were just clever enough to get drivers into trouble. The highways and test tracks they navigated were strictly controlled environments. The instant more variables were added—a pedestrian, say, or a traffic cop—their programming faltered. Ninety-eight per cent of driving is just following the dotted line. It’s the other two per cent that matters. “There was no way, before 2000, to make something interesting,” the roboticist Sebastian Thrun told me. “The sensors weren’t there, the computers weren’t there, and the mapping wasn’t there. Radar was a device on a hilltop that cost two hundred million dollars. It wasn’t something you could buy at Radio Shack.” Thrun, who is forty-six, is the founder of the Google Car project. A wunderkind from the west German city of Solingen, he programmed his first driving simulator at the age of twelve. Slender and tan, with clear blue eyes and a smooth, seemingly boneless gait, he looks as if he just stepped off a dance floor in Ibiza. And yet, like Levandowski, he has a gift for seeing things through a machine’s eyes—for intuiting the logic by which it might apprehend the world. Finally, a year into the project, a Russian engineer named Alex Krasnov cracked the code. They’d thought that stability was a complex, nonlinear problem, but it turned out to be fairly simple. When the bike tipped to one side, Krasnov had it steer ever so slightly in the same direction. This created centrifugal acceleration that pulled the bike upright again. By doing this over and over, tracing tiny S-curves as it went, the motorcycle could hold to a straight line. On the video clip from that day, the bike wobbles a little at first, like a baby giraffe finding its legs, then suddenly, confidently circles the field—as if guided by an invisible hand. They called it the Ghost Rider. The Grand Challenge proved to be one of the more humbling events in automotive history. Its sole consolation lay in shared misery. None of the fifteen finalists made it past the first ten miles; seven broke down within a mile. Ohio State’s six-wheel, thirty-thousand-pound TerraMax was brought up short by some bushes; Caltech’s Chevy Tahoe crashed into a fence. Even the winner, Carnegie Mellon, earned at best a Pyrrhic victory. Its robotic Humvee, Sandstorm, drove just seven and a half miles before careering off course. A helicopter later found it beached on an embankment, wreathed in smoke, its back wheels spinning so furiously that they’d burst into flame. As for the Ghost Rider, it managed to beat out more than ninety cars in the qualifying round—a mile-and-a-half obstacle course on the California Speedway in Fontana. But that was its high-water mark. On the day of the Grand Challenge, standing at the starting line in Barstow, half delirious with adrenaline and fatigue, Levandowski forgot to turn on the stability program. When the gun went off, the bike sputtered forward, rolled three feet, and fell over. “That was a dark day,” Levandowski says. It took him a while to get over it—at least by his hyperactive standards. “I think I took, like, four days off,” he told me. “And then I was like, Hey, I’m not done yet! I need to go fix this!” DARPA apparently had the same thought. Three months later, the agency announced a second Grand Challenge for the following October, doubling the prize money to two million dollars. To win, the teams would have to address a daunting list of failures and shortcomings, from fried hard drives to faulty satellite equipment. But the underlying issue was always the same: as Joshua Davis later wrote in Wired, the robots just weren’t smart enough. In the wrong light, they couldn’t tell a bush from a boulder, a shadow from a solid object. They reduced the world to a giant marble maze, then got caught in the thickets between holes. They needed to raise their I.Q. In the early nineties, Dean Pomerleau, a roboticist at Carnegie Mellon, had hit upon an unusually efficient way to do this: he let his car teach itself. Pomerleau equipped the computer in his minivan with artificial neural networks, modelled on those in the brain. As he drove around Pittsburgh, they kept track of his driving decisions, gathering statistics and formulating their own rules of the road. “When we started, the car was going about two to four miles an hour along a path through a park—you could ride a tricycle faster,” Pomerleau told me. “By the end, it was going fifty-five miles per hour on highways.” In 1996, the car steered itself from Washington, D.C., to San Diego with only minimal intervention—nearly four times as far as Ernst Dickmanns’s cars had gone a year earlier. “No Hands Across America,” Pomerleau called it. Computers, like children, are more often taught by rote. They’re given thousands of rules and bits of data to memorize—If X happens, do Y; avoid big rocks—then sent out to test them by trial and error. This is slow, painstaking work, but it’s easier to predict and refine than machine learning. The trick, as in any educational system, is to combine the two in proper measure. Too much rote learning can make for a plodding machine. Too much experiential learning can make for blind spots and caprice. The roughest roads in the Grand Challenge were often the easiest to navigate, because they had clear paths and well-defined shoulders. It was on the open, sandy trails that the cars tended to go crazy. “Put too much intelligence into a car and it becomes creative,” Sebastian Thrun told me. The second Grand Challenge put these two approaches to the test. Nearly two hundred teams signed up for the race, but the top contenders were clear from the start: Carnegie Mellon and Stanford. The C.M.U. team was led by the legendary roboticist William (Red) Whittaker. (Pomerleau had left the university by then to start his own firm.) A burly, mortar-headed ex-marine, Whittaker specialized in machines for remote and dangerous locations. His robots had crawled over Antarctic ice fields and active volcanoes, and inspected the damaged nuclear reactors at Three Mile Island and Chernobyl. Seconded by a brilliant young engineer named Chris Urmson, Whittaker approached the race as a military operation, best won by overwhelming force. His team spent twenty-eight days laser-scanning the Mojave to create a computer model of its topography; then they combined those scans with satellite data to help identify obstacles. “People don’t count those who died trying,” he later told me. The Stanford team was led by Thrun. He hadn’t taken part in the first race, when he was still just a junior faculty member at C.M.U. But by the following summer he had accepted an endowed professorship in Palo Alto. When DARPA announced the second race, he heard about it from one of his Ph.D. students, Mike Montemerlo. “His assessment of whether we should do it was no, but his body and his eyes and everything about him said yes,” Thrun recalls. “So he dragged me into it.” The contest would be a study in opposites: Thrun the suave cosmopolitan; Whittaker the blustering field marshal. Carnegie Mellon with its two military vehicles, Sandstorm and Highlander; Stanford with its puny Volkswagen Touareg, nicknamed Stanley. It was an even match. Both teams used similar sensors and software, but Thrun and Montemerlo concentrated more heavily on machine learning. “It was our secret weapon,” Thrun told me. Rather than program the car with models of the rocks and bushes it should avoid, Thrun and Montemerlo simply drove it down the middle of a desert road. The lasers on the roof scanned the area around the car, while the camera looked farther ahead. By analyzing this data, the computer learned to identify the flat parts as road and the bumpy parts as shoulders. It also compared its camera images with its laser scans, so that it could tell what flat terrain looked like from a distance—and therefore drive a lot faster. “Every day it was the same,” Thrun recalls. “We would go out, drive for twenty minutes, realize there was some software bug, then sit there for four hours reprogramming and try again. We did that for four months.” When they started, one out of every eight pixels that the computer labelled as an obstacle was nothing of the sort. By the time they were done, the error rate had dropped to one in fifty thousand. On the day of the race, two hours before start time, DARPA sent out the G.P.S. coördinates for the course. It was even harder than the first time: more turns, narrower lanes, three tunnels, and a mountain pass. Carnegie Mellon, with two cars to Stanford’s one, decided to play it safe. They had Highlander run at a fast clip—more than twenty miles an hour on average—while Sandstorm hung back a little. The difference was enough to cost them the race. When Highlander began to lose power because of a pinched fuel line, Stanley moved ahead. By the time it crossed the finish line, six hours and fifty-three minutes after it started, it was more than ten minutes ahead of Sandstorm and more than twenty minutes ahead of Highlander. It was a triumph of the underdog, of brain over brawn. But less for Stanford than for the field as a whole. Five cars finished the hundred-and-thirty-two-mile course; more than twenty cars went farther than the winner had in 2004. In one year, they’d made more progress than DARPA’s contractors had in twenty. “You had these crazy people who didn’t know how hard it was,” Thrun told me. “They said, ‘Look, I have a car, I have a computer, and I need a million bucks.’ So they were doing things in their home shops, putting something together that had never been done in robotics before, and some were insanely impressive.” A team of students from Palos Verdes High School in California, led by a seventeen-year-old named Chris Seide, built a self-driving “Doom Buggy” that, Thrun recalls, could change lanes and stop at stop signs. A Ford S.U.V. programmed by some insurance-company employees from Louisiana finished just thirty-seven minutes behind Stanley. Their lead programmer had lifted his preliminary algorithms from textbooks on video-game design. “When you look back at that first Grand Challenge, we were in the Stone Age compared to where we are now,” Levandowski told me. His motorcycle embodied that evolution. Although it never made it out of the semifinals of the second race—tripped up by some wooden boards—the Ghost Rider had become, in its way, a marvel of engineering, beating out seventy-eight four-wheeled competitors. Two years later, the Smithsonian added the motorcycle to its collection; a year after that, it added Stanley as well. By then, Thrun and Levandowski were both working for Google. The driverless-car project occupies a lofty, garagelike space in suburban Mountain View. It’s part of a sprawling campus built by Silicon Graphics in the early nineties and repurposed by Google, the conquering army, a decade later. Like a lot of high-tech offices, it’s a mixture of the whimsical and the workaholic—candy-colored sheet metal over a sprung-steel chassis. There’s a Foosball table in the lobby, exercise balls in the sitting room, and a row of what look like clown bicycles parked out front, free for the taking. When you walk in, the first things you notice are the wacky tchotchkes on the desks: Smurfs, “Star Wars” toys, Rube Goldberg devices. The next things you notice are the desks: row after row after row, each with someone staring hard at a screen. It had taken me two years to gain access to this place, and then only with a staff member shadowing my every step. Google guards its secrets more jealously than most. At the gourmet cafeterias that dot the campus, signs warn against “tailgaters”—corporate spies who might slink in behind an employee before the door swings shut. Once inside, though, the atmosphere shifts from vigilance to an almost missionary zeal. “We want to fundamentally change the world with this,” Sergey Brin, the co-founder of Google, told me. When Thrun and Levandowski first came to Google, in 2007, they were given a simpler task: to create a virtual map of the country. The idea came from Larry Page, the company’s other co-founder. Five years earlier, Page had strapped a video camera on his car and taken several hours of footage around the Bay Area. He’d then sent it to Marc Levoy, a computer-graphics expert at Stanford, who created a program that could paste such footage together to show an entire streetscape. Google engineers went on to jury-rig some vans with G.P.S. and rooftop cameras that could shoot in every direction. Eventually, they were able to launch a system that could show three-hundred-and-sixty-degree panoramas for any address. But the equipment was unreliable. When Thrun and Levandowski came on board, they helped the team retool and reprogram. Then they equipped a hundred cars and sent them all over the United States. Google Street View has since spread to more than a hundred countries. It’s both a practical tool and a kind of magic trick—a spyglass onto distant worlds. To Levandowski, though, it was just a start. The same data, he argued, could be used to make digital maps more accurate than those based on G.P.S. data, which Google had been leasing from companies like NAVTEQ. The street and exit names could be drawn straight from photographs, for instance, rather than faulty government records. This sounded simple enough but proved to be fiendishly complicated. Street View mostly covered urban areas, but Google Maps had to be comprehensive: every logging road logged on a computer, every gravel drive driven down. Over the next two years, Levandowski shuttled back and forth to Hyderabad, India, to train more than two thousand data processors to create new maps and fix old ones. When Apple’s new mapping software failed so spectacularly a year ago, he knew exactly why. By then, his team had spent five years entering several million corrections a day. Street View and Maps were logical extensions of a Google search. They showed you where to locate the things you’d found. What was missing was a way to get there. Thrun, despite his victory in the second Grand Challenge, didn’t think that driverless cars could work on surface streets—there were just too many variables. “I would have told you then that there is no way on earth we can drive safely,” he says. “All of us were in denial that this could be done.” Then, in February of 2008, Levandowski got a call from a producer of “Prototype This!,” a series on the Discovery Channel. Would he be interested in building a self-driving pizza delivery car? Within five weeks, he and a team of fellow Berkeley graduates and other engineers had retrofitted a Prius for the purpose. They patched together a guidance system and persuaded the California Highway Patrol to let the car cross the Bay Bridge—from San Francisco to Treasure Island. It would be the first time an unmanned car had driven legally on American streets. They started the project with Levandowski’s pizza car and Stanford’s open-source software. But they soon found that they had to rebuild from scratch: the car’s sensors were already outdated, the software just glitchy enough to be useless. The DARPA cars hadn’t concerned themselves with passenger comfort. They just went from point A to point B as efficiently as possible. To smooth out the ride, Thrun and Urmson had to make a deep study of the physics of driving. How does the plane of a road change as it goes around a curve? How do tire drag and deformation affect steering? Braking for a light seems simple enough, but good drivers don’t apply steady pressure, as a computer might. They build it gradually, hold it for a moment, then back off again. It took the team a year and a half to master Page and Brin’s ten hundred-mile road trips. The first one ran from Monterey to Cambria, along the cliffs of Highway 1. “I was in the back seat, screaming like a little girl,” Levandowski told me. One of the last started in Mountain View, went east across the Dumbarton Bridge to Union City, back west across the bay to San Mateo, north on 101, east over the Bay Bridge to Oakland, north through Berkeley and Richmond, back west across the bay to San Rafael, south to the mazy streets of the Tiburon Peninsula, so narrow that they had to tuck in the side mirrors, and over the Golden Gate Bridge to downtown San Francisco. When they finally arrived, past midnight, they celebrated with a bottle of champagne. Now they just had to design a system that could do the same thing in any city, in all kinds of weather, with no chance of a do-over. Really, they’d just begun. These days, Levandowski and the other engineers divide their time between two models: the Prius, which is used to test new sensors and software; and the Lexus, which offers a more refined but limited ride. (The Prius can drive on surface streets; the Lexus only on highways.) As the cars have evolved, they’ve sprouted appendages and lost them again, like vat-grown creatures in a science-fiction movie. The cameras and radar are now tucked behind sheet metal and glass, the laser turret reduced from a highway cone to a sand pail. Everything is smaller, sleeker, and more powerful than before, but there’s still no mistaking the cars. When Levandowski picked me up or dropped me off near the Berkeley campus on his commute, students would look up from their laptops and squeal, then run over to take snapshots of the car with their phones. It was their version of the Oscar Mayer Wienermobile. Levandowski kept a laptop open beside him as we rode. Its screen showed a graphic view of the data flowing in from the sensors: a Tron-like world of neon objects drifting and darting on a wireframe nightscape. Each sensor offered a different perspective on the world. The laser provided three-dimensional depth: its sixty-four beams spun around ten times per second, scanning 1.3 million points in concentric waves that began eight feet from the car. It could spot a fourteen-inch object a hundred and sixty feet away. The radar had twice that range but nowhere near the precision. The camera was good at identifying road signs, turn signals, colors, and lights. All three views were combined and color-coded by a computer in the trunk, then overlaid by the digital maps and Street Views that Google had already collected. The result was a road atlas like no other: a simulacrum of the world. I was thinking about all this as the Lexus headed south from Berkeley down Highway 24. What I wasn’t thinking about was my safety. At first, it was a little alarming to see the steering wheel turn by itself, but that soon passed. The car clearly knew what it was doing. When the driver beside us drifted into our lane, the Lexus drifted the other way, keeping its distance. When the driver ahead hit his brakes, the Lexus was already slowing down. Its sensors could see so far in every direction that it saw traffic patterns long before we did. The effect was almost courtly: drawing back to let others pass, gliding into gaps, keeping pace without strain, like a dancer in a quadrille. The Prius was an even more capable car, but also a rougher ride. When I rode in it with Dmitri Dolgov, the team’s lead programmer, it had an occasional lapse in judgment: tailgating a truck as it came down an exit ramp; rushing late through a yellow light. In those cases, Dolgov made a note on his laptop. By that night, he’d have adjusted the algorithm and run simulations till the computer got it right. The Google car has now driven more than half a million miles without causing an accident—about twice as far as the average American driver goes before crashing. Of course, the computer has always had a human driver to take over in tight spots. Left to its own devices, Thrun says, it could go only about fifty thousand miles on freeways without a major mistake. Google calls this the dog-food stage: not quite fit for human consumption. “The risk is too high,” Thrun says. “You would never accept it.” The car has trouble in the rain, for instance, when its lasers bounce off shiny surfaces. (The first drops call forth a small icon of a cloud onscreen and a voice warning that auto-drive will soon disengage.) It can’t tell wet concrete from dry or fresh asphalt from firm. It can’t hear a traffic cop’s whistle or follow hand signals. And yet, for each of its failings, the car has a corresponding strength. It never gets drowsy or distracted, never wonders who has the right-of-way. It knows every turn, tree, and streetlight ahead in precise, three-dimensional detail. Dolgov was riding through a wooded area one night when the car suddenly slowed to a crawl. “I was thinking, What the hell? It must be a bug,” he told me. “Then we noticed the deer walking along the shoulder.” The car, unlike its riders, could see in the dark. Within a year, Thrun added, it should be safe for a hundred thousand miles. Along with Nissan, Toyota and Mercedes are probably closest to developing systems like Google’s. Yet they hesitate to introduce them for different reasons. Toyota’s customers are a conservative bunch, less concerned with style than with comfort. “They tend to have a fairly long adoption curve,” Jim Pisz, the corporate manager of Toyota’s North American business strategy, told me. “It was only five years ago that we eliminated cassette players.” The company has been too far ahead of the curve before. In 2005, when Toyota introduced the world’s first self-parking car, it was finicky and slow to maneuver, as well as expensive. “We need to build incremental levels of trust,” Pisz said. Even if the new components could be made invisible, Herrtwich says, he worries about separating people from the driving process. The Google engineers like to compare driverless cars to airplanes on autopilot, but pilots are trained to stay alert and take over in case the computer fails. Who will do the same for drivers? “This one-shot, winner-take-all approach, it’s perhaps not a wise thing to do,” Herrtwich says. Then again alert, fully engaged drivers are already becoming a thing of the past. More than half of all eighteen-to-twenty-four-year-olds admit to texting while driving, and more than eighty per cent drive while on the phone. Hands-free driving should seem like second nature to them: they’ve been doing it all along. One afternoon, not long after the car show, I got an unsettling demonstration of this from engineers at Volvo. I was sitting behind the wheel of one of their S60 sedans in the parking lot of the company’s American headquarters in Rockleigh, New Jersey. About a hundred yards ahead, they’d placed a life-size figure of a boy. He was wearing khaki pants and a white T-shirt and looked to be about six years old. My job was to try to run him over. Most accidents are caused by what Volvo calls the four D’s: distraction, drowsiness, drunkenness, and driver error. The company’s newest safety systems try to address each of these. To keep the driver alert, they use cameras, lasers, and radar to monitor the car’s progress. If the car crosses a lane line without a signal from the blinker, a chime sounds. If a pattern emerges, the dashboard flashes a steaming coffee cup and the words “Time for a break.” To instill better habits, the car rates the driver’s attentiveness as it goes, with bars like those on a cell phone. (Mercedes goes a step further: its advanced cruise control won’t work unless at least one of the driver’s hands is on the wheel.) In Europe, some Volvos even come with Breathalyzer systems, to discourage drunken driving. When all else fails, the cars take preëmptive action: tightening the seat belts, charging the brakes for maximum traction, and, at the last moment, stopping the car. I did as instructed. The boy was just a mannequin, after all, stuffed with reflective material to simulate the water in a human body. First a camera behind the windshield would identify him as a pedestrian. Then radar from behind the grille would bounce off his reflective innards and deduce the distance to impact. “Some people scream,” Kopstein said. “Others just can’t do it. It’s so unnatural.” As the car sped up—fifteen, twenty, thirty-five miles an hour—the warning chime sounded, but I kept my foot off the brake. Then, suddenly, the car ground to a halt, juddering toward the boy with a final double lurch. It came to a stop with about five inches to spare. Since 2010, Volvos equipped with a safety system have had twenty-seven per cent fewer property-damage claims than those without it, according to a study by the Insurance Institute for Highway Safety. The system goes out of its way to leave the driver in charge, braking only in extreme circumstances and ceding control at the tap of a pedal or a turn of the wheel. Still, the car sometimes gets confused. Later that afternoon, I took the Volvo out for a test drive on the Palisades Parkway. I contented myself with steering, while the car took care of braking and acceleration. Like Levandowski’s Lexus, it quickly earned my trust: keeping pace with highway traffic, braking smoothly at lights. Then something strange happened. I’d circled back to the Volvo headquarters and was about to turn into the parking lot when the car suddenly surged forward, accelerating into the curve. The incident lasted only a moment—when I hit the brakes, the system disengaged—but it was a little alarming. Kopstein later guessed that the car thought it was still on the highway, in cruise control. For most of the drive, I’d been following Kopstein’s Volvo, but when that car turned into the parking lot, my car saw a clear road ahead. That’s when it sped up, toward what it thought was the speed limit: fifty miles an hour. An automated highway could also be a prime target for cyberterrorism. Last year, DARPA funded a pair of well-known hackers, Charlie Miller and Chris Valasek, to see how vulnerable existing cars might be. In August, Miller presented some of their findings at the annual Defcon hackers conference in Las Vegas. By sending commands from their laptop, they’d been able to make a Toyota Prius blast its horn, jerk the wheel from the driver’s hands, and brake violently at eighty miles an hour. True, Miller and Valasek had to use a cable to patch into the car’s maintenance port. But a team at the University of California, San Diego, led by the computer scientist Stefan Savage, has shown that similar instructions could be sent wirelessly, through systems as innocuous as a Bluetooth receiver. “Existing technology is not as robust as we think it is,” Levandowski told me. If driverless cars were once held back by their technology, then by ideas, the limiting factor now is the law. Strictly speaking, the Google car is already legal: drivers must have licenses; no one said anything about computers. But the company knows that won’t hold up in court. It wants the cars to be regulated just like human drivers. For the past two years, Levandowski has spent a good deal of his time flying around the country lobbying legislatures to support the technology. First Nevada, then Florida, California, and the District of Columbia have legalized driverless cars, provided that they’re safe and fully insured. But other states have approached the issue more skeptically. The bills proposed by Michigan and Wisconsin, for instance, both treat driverless cars as experimental technology, legal only within narrow limits. Much remains to be defined. How should the cars be tested? What’s their proper speed and spacing? How much warning do drivers need before taking the wheel? Who’s responsible when things go wrong? Google wants to leave the specifics to motor-vehicle departments and insurers. (Since premiums are based on statistical risk, they should go down for driverless cars.) But the car companies argue that this leaves them too vulnerable. “Their original position was ‘We shouldn’t rush this. It’s not ready for prime time. It shouldn’t be legalized,’ ” Alex Padilla, the state senator who sponsored the California bill, told me. But their real goal, he believes, was just to buy time to catch up. “It became clear to me that the interest here was a race to the market. And everybody’s in the race.” The question is how fast should they go. At the tech meeting I attended, Levandowski showed the team a video of Google’s newest laser, slated to be installed within the year. It had more than twice the range of previous models—eleven hundred feet instead of two hundred and sixty—and thirty times the resolution. At three hundred feet, it could spot a metal plate less than two inches thick. The laser would be about the size of a coffee mug, he told me, and cost around ten thousand dollars—seventy thousand less than the current model. “Cost is the least of my worries,” Sergey Brin had told me earlier. “Driving the price of technology down is like”—he snapped his fingers. “You just wait a month. It’s not fundamentally expensive.” Brin and his engineers are motivated by more personal concerns: Brin’s parents are in their late seventies and starting to get unsteady behind the wheel. Thrun lost his best friend to a car accident, and Urmson has children just a few years shy of driving age. Like everyone else at Google, they know the statistics: worldwide, car accidents kill 1.24 million people a year, and injure another fifty million. For Levandowski, the stakes first became clear three years ago. His fiancée, Stefanie Olsen, was nine months pregnant at the time. One afternoon, she had just crossed the Golden Gate Bridge on her way to visit a friend in Marin County when the car ahead of her abruptly stopped. Olsen slammed on her brakes and skidded to a halt, but the driver behind her wasn’t so quick. He collided into her Prius at more than thirty miles an hour, pile-driving it into the car ahead. “It was like a tin can,” Olsen told me. “The car was totalled and I was accordioned in there.” Thanks to her seat belt, she escaped unharmed, as did her baby. But when Alex was born he had a small patch of white hair on the back of his head. When we arrived at his house, his family was waiting. “I’m a bull!” his three-year-old, Alex, roared as he ran up to greet us. We acted suitably impressed, then wondered why a bull would have long whiskers and a red nose. “He was a kitten a little while ago,” his mother whispered. A former freelance reporter for the Times and CNET, Olsen was writing a techno-thriller set in Silicon Valley. She worked from home now, and had been cautious about driving since the accident. Still, two weeks earlier, Levandowski had taken her and Alex on their first ride in the Google car. She was a little nervous at first, she admitted, but Alex had wondered what all the fuss was about. “He thinks everything’s a robot,” Levandowski said. While Olsen set the table, Levandowski gave me a brief tour of their place: an Arts and Crafts house from 1909, once home to a hippie commune led by Tom Hayden. “You can still see the burn marks on the living-room floor,” he said. For a registered Republican and a millionaire many times over, it was a quirky, modest choice. Levandowski probably could have afforded that stateroom in a 747 by now, and made good use of it. Last year alone, he flew more than a hundred thousand miles in his lobbying efforts. There was just one problem, he said. It was irrational, he knew. It went against all good sense and a raft of statistics, but he couldn’t help it. He was afraid of flying. Dieser Eintrag wurde veröffentlicht in e-mobility, Einfachheit, Mobility und getaggt mit autonomous driving, Computers, Driverless Cars, Google X, google+, Robotics, Technology am 3. Juni 2014 von innovation.